Notostira species have a longitudinal furrow between the eyes. The genus is sexually dimorphic. 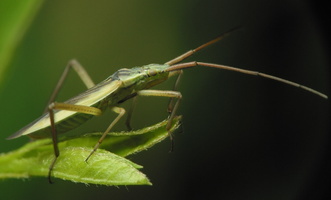 Males are black on the upperside, with the margins yellowish-green, while females are much paler and appear similar to Stenodema laevigata. However, the pronotum is smooth and unpunctured and there are dense dark hairs on the first antennal segment and hind tibiae.